The winds were blowing savagely against my body as I fought to stay on the bike and maintain some control over its movements. It was the beginning of January and normally this time of year most people choose to leave their bikes tucked away in a dry garage. Normally, I would be no different, but I had decided to take my Maxim 650 and head for Spain’s Mediterranean coast. I just hoped that I would make it there in one piece. With the weather the way it was, I was glad that I had been sensible enough to avoid going through France, and book passage on the ferry instead. It hadn’t cost much. For about £100, I bought a one-way ticket for a P&O ferry, that included bike carriage and a cabin, to Bilbao. All I had to do was get to Portsmouth. That was easier said than done. The worst part of the journey was the crossing from the motorway into Portsmouth. There was a vicious cross wind that slowed me to 25 mph and blew my bike into a forty-five degree angle. But I made it, and got safely onboard the ship. In the terminal I had befriended another biker who happened to have the same name as me. He had bought a brand new Honda for a trip to Pau, Southern France. Ian told me that he had ridden from Manchester that day. I had, up until that moment, felt quite proud of myself for battling the forces of nature for a distance of fifty miles. But after hearing about Ian’s ride, I suddenly felt quite humble. We passed the evening sipping ale in the ship’s bar, listening to the worst cabaret duo I’ve ever heard, and ogling the barmaid as her ample breasts moved freely with the motion of the ship. Later that night, as the ship sailed on into the channel, I slept soundly unknowing that outside the winds were blowing at gale force 11. The next morning the ship was being tossed about on 30-foot waves, which made showering, or even walking, very difficult. I was constantly being slammed into the walls or thrown across the bathroom. I emerged looking more of a wreck than when I entered. Up above, people were queuing at the shop to buy travel sickness pills. Everything else was closed due to the fact that nothing would stay still. While all this was going on, I was worried about my bike ending up on the floor. After three days bouncing about on the ocean, we finally arrived in Bilbao at midnight, a day late. We disembarked at 7.00 a.m. Thankfully, our bikes were still in one piece. Outside, it felt quite warm and the wind had dropped completely, so I didn’t bother wrapping-up. I waved goodbye to Ian as he rode off towards France, and turned my bike southward. It was still dark and I had to find a petrol station. As I got on the open-road, I started to shiver as the cold wind hit. At the petrol station I filled-up and then had to convince the attendant, in my best Spanish, that he had short-changed me. I got there in the end and continued onward, but not without additional clothing and thick socks. I wasn’t properly kited-out for very cold weather. Basically because I couldn’t afford it. I hoped that it ouldn’t get much colder. I rode for three-hundred miles that day; through wide mountain passes and narrow twisty roads that seemed to have been designed for a motorbike. I also learnt that having a heavy backpack was not a good idea when riding on mountain roads. It helped me when I lent into the corners, but hindered when it came to straightening-up. It was infuriating. I had taken the Autopista from Bilbao to Zaragoza and it cost me £20 to go a measly 150 miles. So I took the N232 from there onward. It wasn’t that much slower, and was a lot more fun. The Autopista was long, straight and devoid of life. The only other people I saw were old English couples towing their caravans. I hit the Mediterranean coast at 3.00 p.m. and rode down to Peniscola where I spent the night. The town was lined with huge hotels that were all closed. I found a room in the only hotel that was open and had to pay £30. A lot of money on my budget. It was a nice room though, and I made sure that I got my money’s worth by using every facility included. I had this theory that the further south I rode, the warmer it would get. A stupid theory that proved to be wrong in the long run. I was now in the region of Valencia. The entire coastline was inundated with orange plantations. They lined each side of the road and I could have quite easily pulled over and pinched a few. Only I didn’t fancy an irate Spaniard chasing me down the road with a shotgun. The view was perfect. To my left was the sparkling blue Mediterranean Sea, and to my right were the beautiful mountains that sheltered this part of the country, and were the main reason for the warm winter. Although, as soon as the sun went down, so did the temperature.I rode for a further two days down the coastal road. The N340 runs virtually the entire length of the coast, stopping just short of Portugal. It breaks off at certain points, but for the most it stays by the coastline. With scenery like this I couldn’t help but smile as I sped down the highway, passing all the slower traffic and generally feeling like the luckiest person alive. I headed for the Costa Blanca. Somemehow I took a wrong turn and after about half an hour, realised I was going inland. I consulted the map and found a route back to the coast. I took the C320, which is the equivalent to our B-roads, only it was wider and in better condition. As I approached Denia, I rode through mile upon mile of high-rise hotels, and quite frankly it made me sick. After riding through such natural beauty, to see it ruined in this way was not something I wanted to look at. 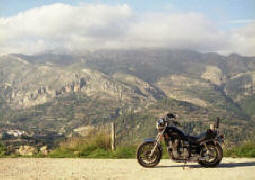 So I wound-up the throttle and continued outhward to Calpe. This was a much nicer town. It had been commercialised, but no so much as the others. I got a room for £6 in a cheap pension that was run by a mad Englishwoman. She was like a female ersion of Basil Fawlty. After three days of hard riding, I decided to rest-up for a while. It was such a nice place and my bike would be safe there. The pension was in a block of residential flats that had a private car park. I could also give my bike a much-needed wash. This part of Spain is very dry and dusty and it leaves your bike filthy.Calpe is a good base from which to take rides into the neighbouring mountains. I visited Guadalest, a town high up in the mountains. The ride there was a series of twists and turns and drops. It was almost like being on a rollercoaster. The riding was much easier without the weight of my luggage though. He was a short, rotund man called Juan, who seemed to have an amazing amount of energy. He would constantly zip around the restaurant, serving and talking to people, and never once seemed to stop. There was a wonderful atmosphere in this place and we got talking to a very nice English couple. The wine that we were drinking was made locally and was very strong. I couldn’t help but notice that Kay was drinking rather a lot of it. I expressed my concern about the fact that she had to drive. ‘Don’t worry,’ she said, ‘I’ll be alright if I have something to eat,’ and promptly fell off her bar stool, hitting the floor with a thud and an, ‘Oh dear!’ Everyone watched in amusement as she clambered back up onto the stool, and I expressed aloud: ‘¡Esta manejando (she’s driving)!’ To which I got some very sympathetic looks. She ordered some tapas, still insisting that she was fine and that she just slipped. And I ordered us a couple of black coffees, which she laced with Cognac. I was beginning to worry. Soon after that we left; but not before I had forced her to drink a straight black coffee. I then spent the journey back to Calpe gripping the edge of my seat and trying my best to shut her up and make her concentrate on the road. ‘I’m fine!’ she would claim, as she swerved the car back from the middle of the road. Don’t ask me how, but we managed to make it back to the pension safe and sound. I made a mental note never to allow this woman to drive me anywhere ever again. I left Calpe and headed further south. I was still clinging to the theory of it being warmer there. I continued along the coastal road, stopping at Alicante and Cartagena. The great thing about Spain is that you can park your bike on the pavement, which meant that I could park outside the pensions and not have to leave it on the road. In Cartagena, I parked right outside the front door of the pension. The owner was very friendly and helpful. Although I think his wife was a bit mad, as she just sat and glared at me each time I walked past. I tried greeting her a few times, but she just continued to glare and mumble to herself. From Cartagena, I rode to the Province of Almeria and stayed in an area called Cabo de Gata. The area receives 100mm of rain each year, making it the driest place in Europe. It is also a magnificent sight. Riding in, I almost felt like I was in the American west, and half expected to see a band of Indians come whooping over the hills. The further down the coast I had come, the windier it had become. As I rode on to Marbella it began to feel a lot colder. Over the five days I spent there, I had one day without rain and used it to ride into the Sierra Blanca mountains. I rode through a series of whitewashed villages. Every single building was white. I wondered if when it came time to repaint, they just evacuated the illage, covered the roads and had a plane fly over and dump a few tons of white paint over it. I headed onwards to Ronda; a town set by the side of a deep gorge. My route took me through a high mountain pass that was in terrible condition. I bounced and shook my way for miles until I came into Ronda. I hoped that nothing had been shaken loose on my bike, or come to think of it, me. I took the main road back to Marbella. I was hoping to continue on toward Portugal the next day but it wasn’t going to happen. This part of Spain was having its worst rain in years. I was staying in the British run Hostal del Pilar. Fortunately it had a bar and open-fire. Mike, the owner, told me that there had been severe flooding in the area. After five days there, I was beginning to claw the walls and decided to make a run for it during a break in the rain. I knew that if I headed west, the weather would get worse, so I headed back east. As soon as I got past Malaga the sun came out and it warmed-up. So much for my theory about it being warmer in the south. I spent another week soaking-up the sun in Calpe before riding back to Bilbao to catch the ferry back home. This time the sea was as calm as a lake. I was sorry to go, but I intended to return one day to see more of this beautiful country that is, in my opinion, a motorcyclist’s dream.